Homogeneity Index (HI) is an objective tool to analyz the uniformity of dose distribution in the target volume. Various formulae have been described in literature for its calculation but there is paucity of data regarding the ideal formula and the factors affecting this index. This study was undertaken to analyze HI in our patients using various formulae and to find out the co-relation between HI and prescribed dose, target volume and target location. A retrospective review of 99 patients was performed. HI was calculated using five different formulae (A-E). The patients were divided in five groups each, based on prescribed dose, target volume and target location and mean HI of each group was analysed to find the co-relation between these factors and HI. When there were multiple target volumes the primary target volume was studied. The statistical calculation was done using SPSS version 16.0. Ninety nine patients were found evaluable with 75 males and 24 females. Ninety five patients were treated with radical intent and four with palliative intent. The sites treated were head and neck (46.4%), Pelvis (17.1%), brain (15.1%), abdomen (12.1%), and thorax (6.1%). The mean prescribed dose was 4304 cGy (centiGray) and the mean target volume was 476.2 cc. The mean value of HI was 1.21, 2.08, 30.13, 21.51 and 1.27 with different formulae. There was considerable agreement between HI calculated using various formulae specially the formulae considering prescribed dose (C, D). On statistical analysis, there was no significant co-relation between the location and volume of target but there was a trend toward better HI with increasing prescribed dose. Future studies with more number of patients can confirm our results. In radiotherapy, since its inception, the objective has always been to deliver maximum dose to the target volume homogeneously, while avoiding dose to the normal surrounding structures. Progress made in last few decades in medical imaging and dosimetric software has allowed us to achieve this objective by visualization of the spatial dose distribution within the target volumes. As a result of these developments, various treatment plans can now be easily and rapidly obtained for the same patient. The dose distribution in these plans can then be visualized in the form of dose-volume histograms (DVHs) and isodose lines, to define parameters like maximum dose (D max ), minimum dose (D min ), mean dose (D mean ) and modal dose delivered to each volume of interest. Unfortunately, the large volume of data contained in these histograms, lines and curves may complicate the problem rather than simplifying it. This makes it desirable to have a tool that can integrate this data in a simpler way to quantitatively assess the quality of the treatment plan options. By using such a tool we can make a choice in favor of a plan which provides maximum tumor coverage homogeneously and protects healthy tissues at the same time. The homogeneity index (HI) and the conformity index (CI) are two such tools for treatment plan analysis in conformal radiotherapy. A more descriptive formula is HI = D 2 -D 98 /D p ×100; where D 2 = minimum dose to 2% of the target volume indicating the "maximum dose", D 98 = minimum dose to the 98% of the target volume, indicating the "minimum dose" and D p = prescribed dose. This is the most commonly used formula in the literature. The reason for choosing D 98 and D 2 , to represent the minimum and maximum dose, is that the calculation of true minimum or maximum dose is sensitive to the dose-calculation parameters, such as grid size and grid placement, and the high dose gradient is common in Intensity Modulated Radio-Therapy (IMRT). Therefore, the true minimum or maximum dose is typically not reliable. This is the reason for choosing the maximum or minimum dose in a volume (D 2 , D 98 etc.) rather than at a point. Thus, in all definitions, HI basically indicates the ratio between the maximum and minimum dose in the target volume and the lower value indicates a more homogenous dose distribution within this volume. Although, various definitions and formulae have been described in literature by various authors and organizations, none has been described as ideal or near ideal for calculating HI. Moreover, less emphasis has been given to this parameter as compared to other treatment planning parameters. For example; several combined indices for evaluating dose coverage, conformity, and dose gradient together have been suggested in the past but, none of these incorporate dose homogeneity as their component. ,,,, In addition, there is a paucity of data in literature regarding the factors that influence HI and the extent of such influence. A search for these factors can enhance our understanding regarding HI, which will allow us to better analyze the spatial dose distribution in our treatment plans. This in turn, will help us to find the means by which we can improve upon our treatment plans in future. In the present study, we reviewed various definitions/formulae of HI that have been described in literature. ,,, We have used these formulae to calculate the HI of each patient and have tried to analyze the concordance level between values of HI obtained with each formula. We also analyzed the association between the HI and the prescribed dose, volume of the target, and location of target in the body. The treating radiation oncologist determined the target volumes and the treatment dose. In most cases, the planning was done with the following aims: minimum dose greater than or equal to 95% and the maximum dose less than or equal to 107% of the prescribed dose. The normalization of each plan followed the recommendation of ICRU report 50. The ICRU point was used for normalization and was set at 100%. This point dose was also the prescribed dose, resulting in a dose variation across the target from 95% to 107% of the prescription dose in most cases. The target volume selected for calculating the HI was PTV. In cases, where two or more target volumes were present, the primary/larger target volume was selected for analysis. The leaf edge to PTV distance (target margin) was kept 7 mm in all cases. The DVH of each plan was generated and it was evaluated by radiation oncologist along with medical physicist until an acceptable plan was obtained. The HI was calculated using the five different formulae given below. Formula B: D max /D min ; where D max and D min represent the maximum and minimum point dose in the target volume, respectively. This formula has not been used in literature but it represents the classical definition of HI i.e., the ratio of maximum and minimum dose. This formula was used to represent the philosophy behind the definition of HI. It may not be technically correct to use this formula in practice as the doses may be very high or very low, if only point doses are considered. The ideal value is 1 and it increases as the plan becomes less homogeneous. Formula C: D 1 -D 98 /D p× 100; where D 1 and D 98 are the minimum dose in 1% and 98% of the target volume and D p is the prescribed dose. This is the formula used for calculating HI in our department which is a slight modification of the formula (D 1 instead of D 2 making it more sensitive) described by Wu, et al. The ideal value is Zero and increase as homogeneity decreases. Formula E: D max /D p ; where D max is the maximum point dose and D p is the prescribed dose to the target volume i.e., the prescription isodose line chosen to cover the margin of the tumor. , This was first described by RTOG and the ideal value is 1. The patients were then divided into five groups, based on the prescribed dose for treatment, volume of target and the location of the target. This resulted in 15 different groups. The mean HI was calculated for each group using all the formulae. The data was then analyzed to find out the relationship between HI and various parameters like prescribed dose, target volume and location of the target (CTV or PTV). The data was compiled using microsoft excel software and mean and median values of HI were calculated using statistical methods. Pearsons Chi-square test (SPSS Vs 16.02) was used to test the association between the mean value of HI calculated by a particular formula and the prescribed dose, volume of target and the location of target in the body. The same test was performed separately for each group using one formula at a time. On final analysis of data, there were 75 males and 24 females. 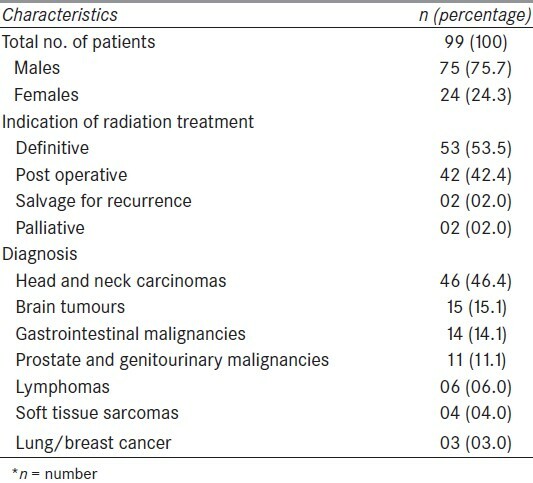 These patients received radiation for different diagnoses including head and neck carcinomas (46.4%), brain tumours (15.1%) and other malignancies. Most of the patients i.e., 95.9% were treated with radical intent while others were treated for palliation. Detailed descriptive data of the patients is presented in [Table 1]. The minimum, maximum, mean and median value of HI was calculated using different formulae (A, B, C, D and E) for all the patients collectively, as shown in [Table 2]. Since it was a retrospective study, few of the values (D 5 or D 95 ) required for calculating HI were not recorded in 33% of all the patients. Thus, formulae A and D could be applied in 67 and 66 patients, respectively. All other formulae were applied in all the patients. Analysis of minimum HI (best homogeneity) by all formulae revealed that, four (A, C, D, E) out of five formulae showed this value in the same patient. The patient was a case of carcinoma prostate (Pelvis) with prescription dose of 2414 cGy (centiGray) for a boost volume of 268.2 cc. This shows the level of agreement or concordance among various formulae. The same trend however, could not be observed while analyzing the maximum value of HI in similar manner. The maximum value of HI was seen in different patient by each formula. The dose prescription varied from 1600 cGy to 7000 cGy. The overall mean and median prescribed dose was 4304 cGy and 4500 cGy, respectively. This large variation is explained by the fact that many patients were planned for IMRT boost (following the initial treatment with conventional or 3-Dimensional conformal radiotherapy) or palliative radiation requiring lesser dose. The patients were divided into five groups according to prescribed dose and mean HI for each group was calculated using formulae A to E. The resulting values of HI are shown in [Table 3]. According to dose, the lowest values of HI (best homogeneity) were seen in the group receiving highest dose i.e., 6000 cGy or more, by all the formulae. Similarly, the highest values of HI were seen in first two groups i.e., 4000 cGy or less. This again shows the high level of agreement between various formulae and suggests a trend towards improved HI as the prescribed dose increases. When analysed statistically, significant difference in HI was found between the group using formulae A, C and D. The other formulae could not reach a significant value. When target volume data was analyzed, volume of the target varied from 84.2 cc to 2247 cc, with a mean and median value of 476.2 cc and 360 cc, respectively. The patients were divided into five groups according to the volume of targets and mean HI for each group was calculated using formula A to E [Table 4]. When analyzed in detail, the lowest values (best homogeneity) of HI by all the formulae were seen in group having the lowest target volume i.e., 400 cc or less. On the other hand, the highest HI was seen in last two groups (1201 cc or more) by all formulae except formula B. This indicates a reasonable level of agreement or concordance between different formulae except formula B. This observation suggests a trend towards worsening of HI as the target volume increases. When this observation was statistically analysed, no statistically significant difference in HI was found between the groups with different target volume. When divided into groups depending on the location of the target in the body, the maximum number of patients (49.5%) were in the head and neck group (49.5%), followed by pelvis (17.1%) and others. The exact distribution of patients according to location and the mean values of HI using various formulae are shown in [Table 5]. The brain cases were found to have the highest value by all the formulae. In contrast, the best HI was observed in cases of abdomen (formula A, D) and thorax (B, C, E). The value of HI in head and neck and pelvic tumors were lying in-between. This shows the level of agreement among various formulae used for calculating HI. On statistical analysis, no statistically significant association was found between the location of the target in the body and the HI. Collins et al., studied the relationship of variables like shape, size and complexity of skull base tumors with parameters like new CI, HI, and percentage tumor coverage using cyberknife radiosurgery system. They found that these radiosurgical parameters using cyberknife were independent of these tumor variables. In another study, to evaluate the association of Conformity Distance Index with the size and shape of the target volume, Wu et al. found that both volume and shape complexity can have significant effects on conformity values. They found that conformity indices tend to have inferior values for smaller or more complex targets as compared to those with larger volumes or simpler shapes. All these studies were more focused on analyzing the conformity rather than homogeneity indices. In our analysis, we have focused ourselves to the HI and found a trend towards improved homogeneity as the target volume reduces and vice-verse. In our analysis, the correlation between HI and prescribed dose was a novel idea. It showed a trend towards improved HI with increasing value of prescribed dose. These values also reached near statistical significance in some cases. The reason for this trend is the fact that in cases with lower prescribed dose; even a slight variation of dose across the target volume became significant in relation to the prescribed dose. An important point is the fact that formula B did not show any significant correlation with dose as this does not take into account the prescribed dose unlike formula C, D, and E which seems to be more sensitive to the change in the dose values. Thus, the formulae which consider the prescribed dose seem to be more sensitive while calculating HI. In our study, best HI was found in thoracic and abdominal cases while inferior values were seen in brain tumors. These finding may be a reflection of various other factors rather than the mere location of the target. Since, in our study, the prescribed dose was lower in case of brain lesions as in many cases it was the IMRT boost, the inferior HI could be a reflection of the lower prescribed doses. The radiation oncologist, while evaluating a plan has to consider clinical, biologic, geometric, dosimetric and radiologic parameters at the same time, which is an essential but complex and time consuming process. As described above, HI can facilitate by providing an objective measure of the homogeneity, which is an important quality indicator for a plan. Often, radiation oncologist is provided with various plans for the same patients and making a choice becomes difficult in the absence of objective parameters. HI along with other indicators can be used to choose the best plan among available options. This tool can also be used to compare various devices or techniques. For example, the dosimetric studies of ellipsoid phantoms have shown that the cyberknife radiosurgical system has the best homogeneity within the target volume as compared to other radiosurgical devices like gamma knife, linear accelerator based stereotactic radiosurgery systems with multiple arcs or IMRT. Thus, it can serve as a guide for development of future strategies, technology and treatment protocols. At the present time, only geometric and dosimetric data is incorporated while calculating or analyzing these indices. Since various radiobiological parameters like tumor control probability (TCP) and normal tissue complication probability (NTCP) and Equivalent Uniform Dose (EUD) have been incorporated in the treatment planning systems, there is a need to incorporate them in defining HI. Recent studies have suggested that somewhat greater dose heterogeneity in target volumes is expected by using biological cost functions for treatment planning. Integration of these probabilistic data in calculation of quality indicators will allow us in selection of a treatment plan on the basis of radiobiologic characteristics of the target tissues rather than merely the physical doses and volumes. Planning indicators like HI depend upon the particular formula which is being used for its calculation. So, attention is required while calculating it. For example, when comparing different treatment plans or different irradiation techniques, it is important to use the same formula. It is emphasized to clearly specify the target volume, to which the homogeneity index corresponds, because depending on the choice of tumor volume (CTV or PTV) and the margins used, the results can vary considerably, leading to erroneous conclusions. In our study, we have considered PTV in all the cases. It is not always justified to try for achieving the ideal value of HI at any cost. There are certain clinical situations where in-homogeneity may be desirable. Tumors containing heterogeneous group of cell population may benefit by delivering higher dose to the areas where there is increased density of malignant cells or there are pockets containing resistant cells. Non-homogenous dose with higher central dose may improve local control in such cases; however, this increased local control come with increased risk of complications. , In certain cases, while we try to achieve homogeneity within the target volume at any cost, the system tends to dump the extra dose (hot spot) outside the target to improve the HI, which may prove detrimental. In cases such as SRS, in which the target may lie in very close proximity to a critical organ or nerve (acoustic neuroma), very high hot spots outside the PTV potentially increases the risk of complication. The importance of dose homogeneity in biologically optimized IMRT plans is controversial because if eventually the plan quality is judged by predicted biological outcome, it may no longer be required to keep the dose to target volumes as homogeneous as possible at all cost. Moreover, dosimetric priorities are not the same for benign and malignant lesions. In benign lesions, heterogeneity may be acceptable in order to save the critical structure lying close to the target volume. Thus, HI should not be seen as a tool which can replace the utility of checking the plan slice by slice for detecting and unreasonable high or low dose points. It should only be used once a satisfactory plan has been achieved on the basis of dose gradients and dose distribution along the treatment volumes and normal structures. There is thus no consensus about the acceptable limit of HI. A value of less than 2.0 (RTOG/Formula E) is felt to balance the risk of local failure and neurologic injury (RTOG guidelines). Although in our study no limitation was placed on the target volume or location of tumor in the close proximity to critical structures, a value of less than 2.0 was achieved in majority of the cases. Our analysis shows a reasonably high level of agreement or concordance between different formulae used for calculating the HI. This holds more significance for the formulae which accounts for the prescribed dose in denominator. It suggests that any of the described formulae may be used to calculate the HI for a particular case, provided the mentioned factors are kept in mind. Statistically, although the study suggested that the HI index is independent of the location and the treatment volume, the trend towards an improved HI in cases with higher prescribed dose warrants further studies, with large number of patients, which may throw some more light in proving or refuting such type of association. Moreover, prospective studies with a long follow up may establish relationship between these parameters and clinical outcomes. The literature review also suggests that although the HI is a good indicator of the quality of a plan, the analyses of DVHs and CT sections still remains an integral part of treatment plan evaluation till the ideal HI is discovered. 1. Shaw E, Kline R, Gillin M, Souhami L, Hirschfeld A, Dinapoli R, et al. Radiation Therapy Oncology Group: Radiosurgery quality assurance guidelines. Int J Radiat Oncol Biol Phys 1993;27:1231-9. 2. Feuvret L, Noel G, Mazeron JJ, Bey P. Conformity index- a review. Int J Radiat Oncol Biol Phys 2006;64:333-42. 3. Gong Y, Wang J, Bai S, Jiang X, Xu F. Conventionally-fractionated image-guided intensity modulated radiotherapy (IG-IMRT): A safe and effective treatment for cancer spinal metastasis. Radiat oncol 2008;3:11. 4. Wu Q, Mohan R, Morris M, Lavue A, Schmidt-Ullrich R. Simultaneous integrated boost intensity-modulated radiotherapy for locally advanced head-and-neck squamous cell carcinomas: Dosimetric results. Int J Radiat Oncol Biol Phys 2003;26:573-85. 5. Wagner TH, Bova FJ, Friedman WA, Buatti JM, Bouchet LG, Meeks SL. A simple and reliable index for scoring rival stereotactic radiosurgery plans. Int J Radiat Oncol Biol Phys 2003;57:1141-9. 6. Lomax NJ, Scheib SG. Quantifying the degree of conformity in radiosurgery treatment planning. Int J Radiat Oncol Biol Phys 2003;55:1409-19. 7. Bova FJ, Meeks SA, Friedman WA. Stereotactic plan evaluation tool "the UF index". Int J Radiat Oncol Biol Phys1999;45:188. 8. Van't Riet A, Mak AC, Moerland MA, Elders LH. A conformation number to quantify the degree of conformality in brachytherapy and external beam irradiation: Application to the prostate. Int J Radiat Oncol Biol Phys 1997;37:731-6. 9. Baltas D, Kolotas C, Geramani K, Mould RF, Ioannidis G, Kekchidi M, et al. A conformal index (COIN) to evaluate implant quality and dose specification in brachytherapy. Int J Radiat Oncol Biol Phys 1998;40:515-24. 11. Semerenko VA, Reitz B, Day E, Qi XS, Miften M, Li XA. Evaluation of a commercial biologically based IMRT treatment planning system. Med Phys 2008;35:5851-60. 12. Collins SP, Coppa ND, Zhang Y, Collins BT, McRae DA, Jean WC. Cyberknife radiosurgery in the treatment of complex skull base tumors: Analysis of treatment planning parameters. Radiat Oncol 2006;1:46. 13. Knoos T, Kristensen I, Nilsson P. Volumetric and dosimetric evaluation of radiation treatment plans: Radiation conformity index. Int J Radiat Oncol Biol Phys 1998;42:1169-76. 14. Wu VW, Kwong DL, Sham JS. Target dose conformity in 3-dimensional conformal radiotherapy and intensity modulated radiotherapy. Int J Radiat Oncol Biol Phys 2004;71:201-6. 15. Wu QR, Wessels BW, Einstein DB, Maciunas RJ, Kim EY, Kinsella TJ. Quality of coverage: Conformity measures for stereotactic Radiosurgery. J Appl Clin Med Phys 2003;4:374-81. 16. Yu C, Jozsef G, Apuzzo ML, Petrovich Z. Dosimetric comparison of cyberKnife with other radiosurgical modalities for an ellipsoidal target. Neurosurgery 2003;53:1155-62; discussion 1162-3. 17. Chang SD, Gibbs IC, Sakamoto GT, Lee E, Oyelese A, Adler JR. Staged stereotactic irradiation for acoustic neuroma. Neurosurgery 2005;56:1254-61; discussion 1261-3. 18. Wang X, Zhang X, Dong L, Liu H, Gillin M, Ahamad A, et al. Effectiveness of noncoplaner IMRT planning using a parallelized multiresolution beam angle optimization method for paranasal sinus carcinoma. Int J Radiat Oncol Biol Phys 2005;63:594-601. 19. Dejean C, Lefkopoulos D, Foulquier JN, Schlienger M, Touboul E. Automatic definition of prescription isodose for stereotaxic radiation of arterio-venous malformations. Cancer Radiother 2001;5:138-49. 20. Grandjean P, Platoni K, Lefkopoulos D, Merienne L, Schlienger M. Use of a general inverse technique for the conformational stereotactic treatment of complex intracranial lesions. Int J Radiat Oncol Biol Phys 1998;41:69-76. 21. Akpati H, Kim CS, Kim B, Park T, Meek A. Unified dosimetry index (UDI): A figure of merit for ranking treatment plans. J Appl Clin Med Phys 2008;9:2803.